It's been five years since Ftarri, an online CD shop and record label specializing in improvised music, opened a physical store of the same name in Suidobashi, Tokyo. This is the fourth title in a four-CD series celebrating the store's fifth anniversary. "Scores 1200," the CD's 60-minute track, is a composed work by Hiroyuki Ura based on a sculpture by Kenichi Kanazawa. 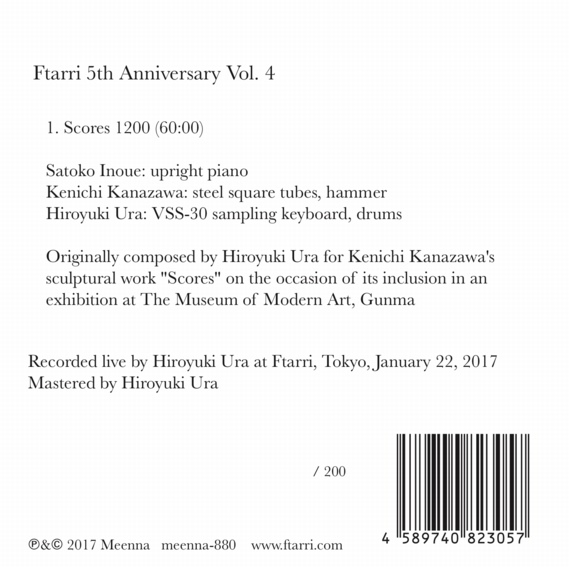 A live performance by the trio of Kanazawa (steel square tubes, hammer), Ura (VSS-30 sampling keyboard, drums) and pianist Satoko Inoue in the gallery of The Museum of Modern Art, Gunma, in October 2016, was released as a CD by Ftarri in February 2017. Prior to that, on January 22, 2017, the three musicians gave a concert at Ftarri to commemorate the release, performing the same piece as on the CD. 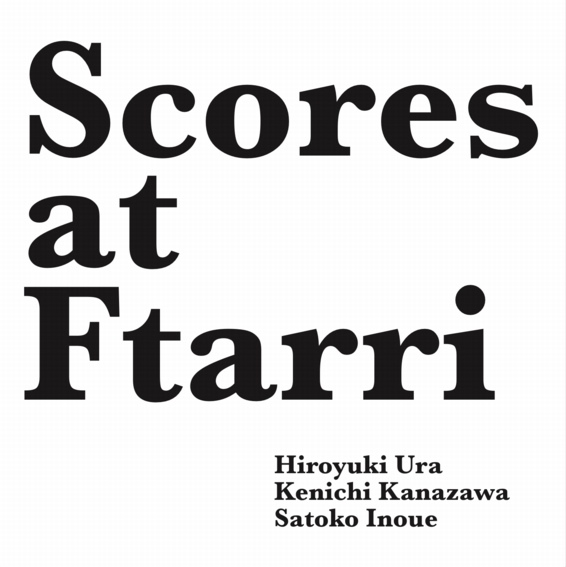 Scores at Ftarri is the recording of that live performance. Inoue played Ftarri's upright piano. The other two used the same instruments and objects as in the museum performance. Though the composition is the same, one experiences the illusion of listening to a different piece due to the marked difference between the acoustic environments at the museum gallery and Ftarri. But the composition and performance are just as great. It's a superb work of a different kind, bringing out new delights. Limited edition of 200, consecutive numbering.